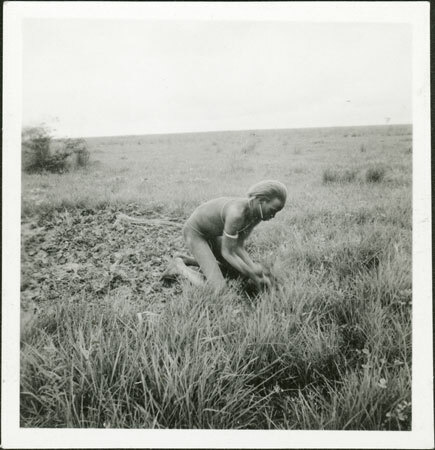 A man on his knees in a garden area clearing tufts of grass in preparation for sowing a late millet crop, sometime around September. Cultivation, along with fishing, was considered a subsidiary but necessary activity by the cattle keeping Nuer. Note on print reverse ms pencil - "A168 3049 [numerous printer's marks]"
Morton, Chris. "Nuer man clearing garden" Southern Sudan Project (in development). 03 Jan. 2006. Pitt Rivers Museum. <http://southernsudan.prm.ox.ac.uk/details/1998.346.340.2/>.